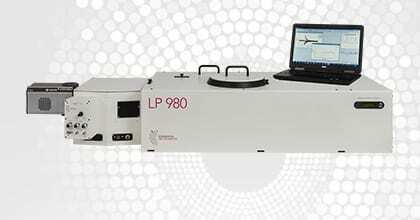 Transient absorption measurements / laser flash photolysis is applicable to liquid, gaseous, and solid samples. Liquids are usually measured in a cuvette with the pump beam and the probe beam overlapping orthogonally (transverse excitation). In gaseous samples the concentration of the participating molecules is much lower and a co-linear setup between the pump and probe beam is preferred to improve the signal to noise ratio. Film samples, powders and non transparent bulk samples are generally studied in a diffuse reflectance setup. The sample being investigated is exposed to an intense laser pump pulse, which creates the transient species, and the probe source, which forms the background for the time dependant absorption measurement. For time scales in the microsecond and nanosecond range the required high background level of the probe light is created by the intense flash from the pulsed xenon lamp which – after some stabilisation period – reaches a sufficiently flat plateau. This plateau level represents the pre-photolysis background level of the transmitted light through the sample. At a pre-set time after lamp triggering, when the pulse plateau is flat, the excitation laser is triggered creating the transient species under investigation. The absorption of the transient species is usually time dependent and produces a time dependent change in the transmission of the sample. The change in optical density, ΔOD, can then be analysed using exponential least squares fitting algorithms, resulting in transient lifetimes or rate constants. To protect the sample against photobleaching by unnecessary radiation exposure between measurements and as a means to control background measurements, high speed shutters are operated to control the probe and laser beam prior to entering the sample. For laser induced emission measurements the probe shutter remains permanently closed.